In addition to the constant rumors of marital strife between mainland Chinese actress Yang Mi (楊冪) and Hong Kong actor Hawick Lau (劉愷威), the couple has also been plagued with accusations of being absent in the life of their two-year-old daughter, nicknamed “Little Sticky Rice.” Due to Yang Mi and Hawick’s busy filming schedule in Mainland China, Little Sticky Rice has been raised by Hawick’s parents in Hong Kong for two years. However, Yang Mi was recently spotted sending her daughter to school and picking her up later in the day. 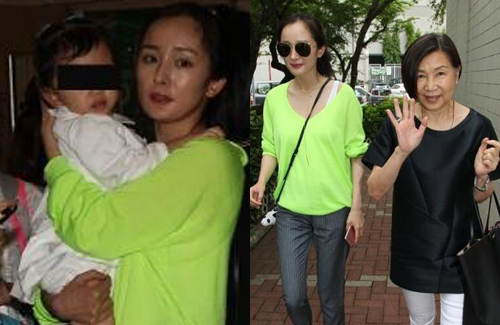 At about 8:30 a.m. on August 29, Yang Mi was seen wearing a fluorescent green shirt and holding her daughter. Mother and daughter were also accompanied by Hawick’s mother. The trio made their way to Causeway Bay Victoria Kindergarten, where they were quickly escorted into the building by the school principal once they were alerted to the media’s presence. During this time, Yang Mi continuously used her body to shield her daughter from camera lenses. Approximately two hours later, Yang Mi and her mother-in-law left the school campus and were immediately questioned by the media. Yang Mi revealed that for the time being, she would remain in Hong Kong, presumably due to a lack of filming engagements. On the other hand, Hawick was currently working in mainland China. Yang Mi also shared that her daughter enjoyed school and had not cried about attending school. Her mother-in-law added that Little Sticky Rice had attended preschool before, so that day was not her first day in a school environment. Good to know she’ll be spending some time with her daughter as before she know it, she will be all grown up!!!! @happybi I know right? Too bad can’t see the daughter face. @asian2015 i do enjoy seeing celebrity kids photos but sometime i do feel they need more privacy. Too many crazy people these days.